This is a very stylish sideways handcuff charm bracelet set. The handcuff charm is silver tone and approx 1". 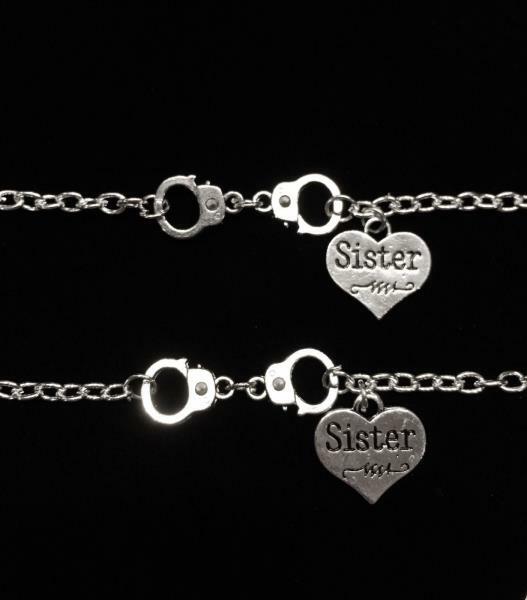 The sister charm is silver tone and approx 2/3". Chain is silver plated chain. The bracelet closes with a lobster clasp. You can get this bracelet in a 6, 7, 8, or 9" length. Please leave a note at checkout for the length you would like the bracelet to be. If no note is left, a 7" bracelet will be sent. Made of silver plated alloy. Listing includes 2 bracelets.